I like paper and I print less of it: Oxymoron or Reality? | Document Advisors | IDeAs blog, for better document strategies. I like paper and I print less of it: Oxymoron or Reality? Is the Industry in a state of denial or should it remain optimistic? In a recent post, I mentioned that printed-paper volumes could well be declining in 2015 and quite sharply. A reader of the blog sent me an article, part of a campaign from the paper industry indicating that paper, as a medium was the “perfect ally for relaxed moments and thought over decisions”. The reader, who works for an OEM, implied in a nice way that I was over pessimistic and paper was here to stay. My conclusion is that there is no contradiction in terms. Our discussion is in fact too global and therefore too simplistic. One should narrow it to major usage types and see how each one of those could evolve and then rewind the maths back on the global numbers. 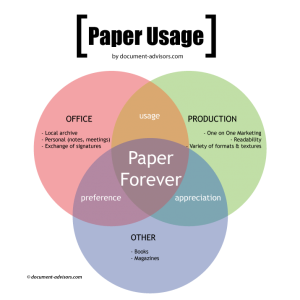 The article stresses the reasons why the public in general likes paper. So it applies to everything from marketing material and catalogues to office paper or potentially love letters. They range into two categories (practical such as read, write, understanding, reliable, etc.. and emotional such as quiet, serene, likeable, etc…). I think the Paper industry is responding to former bashing campaigns that were driven by software manufacturers using words like obsolete, cumbersome, expensive, dirty, polluting, etc…. It is not really positioning paper on where it is more efficient than digital. And there are such places. Reading on paper any document of more than two or three screens brings a better comprehension and memorisation of its content. Legibility is key. Let us remark that Smartphones screens are much worse than classic PCs 15″ inch screens. This explains the introduction and success of Tablets with all this fighting over legibility and screen sizes. Paper has objective qualities in the office. 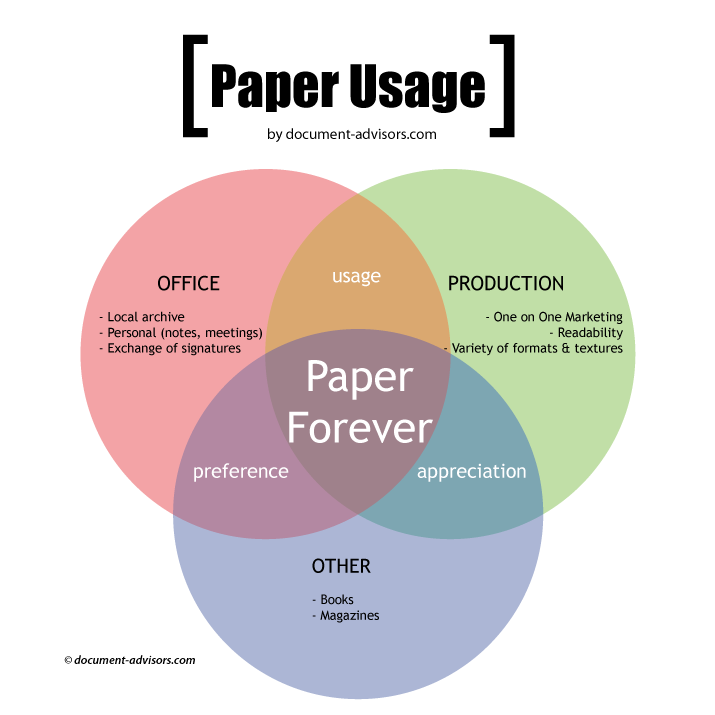 Paper usage in the office is mostly comprised of THREE types: discover them here. I like paper and I print less of it: Oxymoron or Reality? [part 2] | Document Advisors | IDeAs blog, for better document strategies. This article was written on 17 Feb 2015, and is filled under Business Forecast, Point of View.